VINCENT was archdeacon of the church at Saragossa. Valerian, the bishop, had an impediment in his speech; thus Vincent preached in his stead, and answered in his name when both were brought before Dacian, the president, during the persecution of Diocletian. When the bishop was sent into banishment, Vincent remained to suffer and to die. First of all, he was stretched on the rack; and, when he was almost torn asunder, Dacian, the president, asked him in mockery “how he fared now.” Vincent answered, with joy in his face, that he had ever prayed to be as he was then. It was in vain that Dacian struck the executioners and goaded them on in their savage work. The martyr’s flesh was torn with hooks; he was bound in a chair of red-hot iron; lard and salt were rubbed into his wounds; and amid all this he kept his eyes raised to heaven, and remained unmoved. He was cast into a solitary dungeon, with his feet in the stocks; but the angels of Christ illuminated the darkness, and assured Vincent that he was near his triumph. His wounds were now tended to prepare him for fresh torments, and the faithful were permitted to gaze on his mangled body. They came in troops, kissed the open sores, and carried away as relics cloths dipped in his blood. Before the tortures could recommence, the martyr’s hour came, and he breathed forth his soul in peace. Even the dead bodies of the saints are precious in the sight of God, and the hand of iniquity cannot touch them, A raven guarded the body of Vincent where it lay flung upon the earth. When it was sunk out at sea the waves cast it ashore; and his relics are preserved to this day in the Augustinian monastery at Lisbon, for the consolation of the Church of Christ. Reflection.—Do you wish to be at peace amidst suffering and temptation? Then make it your principal endeavor to grow in habits of prayer and in union with Christ. Have confidence in Him. He will make you victorious over your spiritual enemies and over yourself. 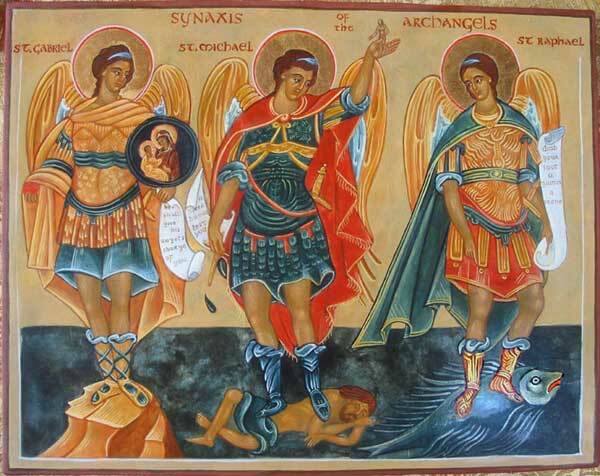 He will enlighten your darkness and sweeten your sufferings, and in your solitude and desolation He will draw nigh to you with His holy angels. 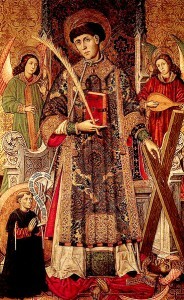 St. Vincent, Martyr pray for us!